If this is a technical issue, it's darn just about the weirdest one that I've ever seen in a lifetime filled with playing with gadgets. And I'm also reminded of Auric Goldfinger's classic line to James Bond: "Once is happenstance. Twice is coincidence. The third time it's enemy action." If this happens a third time, I'm going to have the whole thing stripped down and examined, psychoanalyzed and possibly exorcised. Or perhaps it's some subliminal cue from my own superego that is trying to tell me something? This morning while rewatching last night's episode of Lost from my DVR, I did a search back through previous recordings from the past weekend, 'cuz there were a bunch of good movies that I wanted to catch for the first time. Somehow, my DVR also recorded a movie that I have seen before, but didn't have schedule to record. The really crazy thing is, this has happened before. And involving to the exact same movie. So for the second time my DVR, without me asking it to, has caught Yentl: the 1983 film directed, co-written by and starring Barbra Streisand. If you've never seen it before, Yentl is about a Jewish girl living in Poland at the turn of the twentieth century who more than anything else in life wants an education in Talmudic law. But alas! This is a time and place where only men are allowed to study such things. So after her father (a respected rabbi who has been teaching her in secret) died, Yentl disguises herself as a man and as "Anshel" goes off to study in a yeshiva. As usually happens in this kind of story, complications ensue: namely when Yentl - as Anshel - winds up engaged to the former fiancee of her/his friend Avigdor (played by Mandy Patinkin, in what might be his finest role alongside that of Inigo Montoya from The Princess Bride). Now, I have absolutely nothing at all against Yentl. It's a delightful little movie and rather different from typical film fare. It's a drama with music, not really a traditional "musical" since Yentl is the only one singing in it and it's more of an "empathic device" to convey Yentl's inner turmoils. 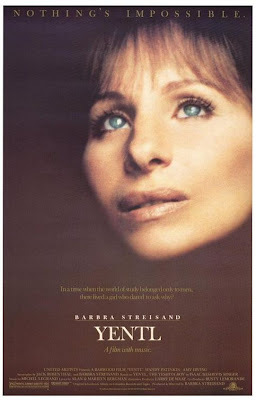 The story, based on a play by Isaac Bashevis Singer, is a clever one and the cinematography (Yentl was filmed partly in Prague and Liverpool) is gorgeous. I'd just like to know WHY THE HECK IS MY DVR BOUND AND DETERMINED TO RECORD YENTL!!! I said it the last time my DVR did this and I'll say it again: Oy vey!